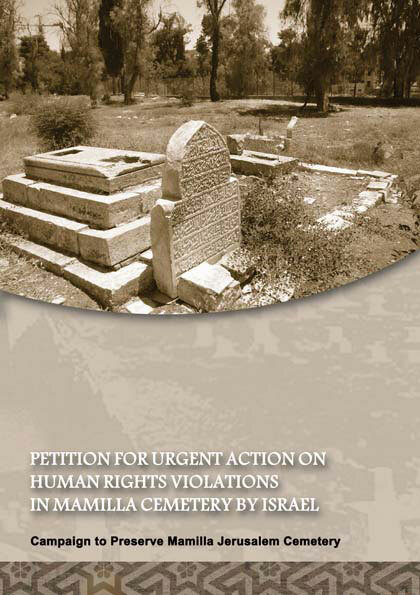 The Petitioners are individuals whose human rights have been violated by the destruction and desecration of an ancient Muslim cemetery, the Ma’man Allah (Mamilla) cemetery in Jerusalem, by the government of Israel working in conjunction with the Simon Wiesenthal Center (“SWC”) of Los Angeles, California, USA.1 Petitioners also include human rights non-governmental organizations concerned about this desecration. A significant portion of the cemetery is being destroyed and hundreds of human remains are being desecrated so that SWC can build a facility to be called the “Center for Human Dignity - Museum of Tolerance” on this sacred Muslim site. These earlier proclamations by Israeli authorities appeared to recognize the sacredness with which Muslims view their burial grounds, and the Mamilla cemetery in particular.10 Islamic jurisprudence consistently holds burial sites to be eternally sanctified, and disinterment of human remains is expressly prohibited. As with other monotheistic religions, the rites and beliefs associated with death and burial are an integral part of the religious practices and beliefs of Muslims everywhere. The petitioners have exhausted all means at their disposal to prevent further desecration of this sacred cemetery and, hence, bring the matter to your urgent attention, as Israel’s conduct blatantly violates international human rights law, as detailed below. Given this pattern of discrimination, not only with regard to the treatment of holy sites, but in all facets of the Israeli government’s relationship with the Muslim and Christian communities under its control,23 it is no surprise that attempts to stop the desecration of Mamilla, legally and otherwise, have been rebuffed by Israeli authorities. A subsequent petition to nullify the IAA’s decision to release the site for construction, based on the above revelations, has recently been denied by the High Court on largely procedural grounds, namely, that there was nothing in the second petition that was novel, and that it therefore could not reconsider its previous ruling.32 While stating that Suleimani’s report to the IAA had been submitted to the Court during hearings on the previous petition, the Court did not address, as it had failed to do in its first judgment, the significant contradictions between Suleimani’s report and the information provided by the IAA regarding the progress and results of the excavations on the site. 33Rather, it reiterated the IAA’s version of the results, which its Chief Excavator Suleimani attested was “a factual and archaeological lie.”34 This showed a puzzling disregard of the facts that should have been central to the Court’s decision in both judgments, namely, that the Museum’s construction was taking place on an ancient cemetery site replete with Muslim graves and human remains, which were being desecrated in the process. This ruling, together with the Court’s 2008 ruling, clearly illustrates the Court’s bias in favor of allowing the SWC “Center for Human Dignity - Museum of Tolerance” to be constructed. Its decisions make evident that the High Court, in keeping with the Israeli judiciary’s clear bias in favor of Jewish interests above those of Palestinians, views Israel’s development prerogatives as more important than respecting the religious beliefs of and preserving the cultural heritage of its disdained minority Muslim and Christian populations. Petitioners thus have no recourse but to international human rights law and the institutions tasked with upholding it, to which this petition is submitted. The right to protection of cultural heritage and cultural property, including religious sites such as cemeteries, as guaranteed by international human rights instruments such as the UNESCO World Heritage Convention, the Universal Declaration of Human Rights (UDHR), the International Covenant on Civil and Political Rights (ICCPR) and the International Convention on Economic, Social and Cultural Rights (ICESCR), and buttressed by extensive international humanitarian law protections, the principles of which are considered customary international law principles. The right to manifest religious beliefs, as propounded in the UDHR and the ICCPR. The right to freedom from discrimination, as set forth in the Convention on the Elimination of All Forms of Racial Discrimination (CERD), the ICCPR and the ICESCR. IV.The right to family and culture, as set forth in the UDHR, ICCPR, and the ICESCR. Declare the entire historic site of the Mamilla cemetery an antiquity, to be preserved and protected henceforth by its rightful custodians, the Muslim Waqf (public endowment) authorities in Jerusalem. Based on the mandate laid out in the Human Rights Council resolution of October 21, 2009, petitioners request that the United Nations High Commissioner for Human Rights consider this complaint on an urgent basis and investigate and report on Israel’s violation of the above human rights, which, together with other Israeli actions that degrade or damage non-Jewish religious sites, constitute a pattern of gross violations of the human rights of Palestinians and Muslims. Petitioners request that the Director General of UNESCO consider this complaint in light of existing UNESCO resolutions on the subject and the human rights violations alleged herein, and coordinate efforts with the above-mentioned United Nations officials in order that the Mamilla cemetery, a cultural and religious heritage site of great value, be preserved and protected. Petitioners request that the Government of Switzerland, in its capacity as depository of the Fourth Geneva Convention, consider this issue in the context of resuming the High Contracting Parties’ Conference to the Fourth Geneva Convention.